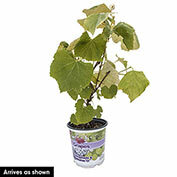 A longtime favorite in home gardens, Concord Grape is now available in a gallon pot and shipping now. 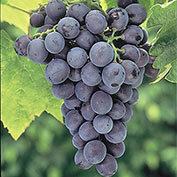 Concord Grape vine produces clusters of blue-black grapes that are favorites for making into juices, jams, jellies and wines. The vigorous vines also have an ornamental value and can be grown on fences, walls, trellises and arbors. Grows best in full sun. Deer tend to avoid. Potted. Zones 5-8. Foliage: 6-inch, deeply lobed and rounded leaves, quite ornamental. 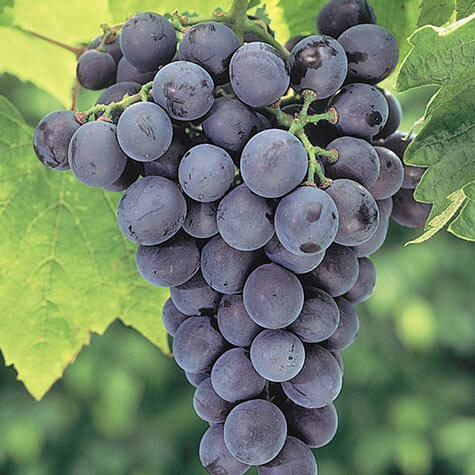 Fruit: Deep purple grapes, full of flavor and sweetness. Flower Form: Small, 5-petaled, white flowers are held in narrow panicles. Growth Rate: Fast, once established. Pruning: For best fruit production, prune in winter when the plant is dormant, but before the temperatures become too cold. Follow the instructions in the planting guide.